The markings on mail provide valuable clues to the surprising ways mail has been transported over time, revealing challenges and even disasters encountered along the way. Learn to analyze and decipher these marking by tracing the journeys of three historic letters and investigate markings on mail transported on land, across seas, by air, and in space. 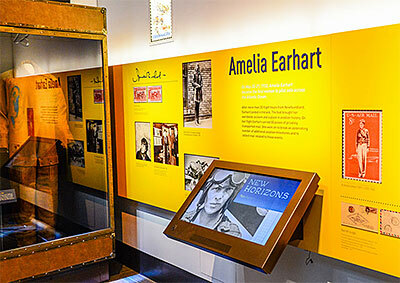 Among the many historic artifacts on view are a 1390 Silk Road letter; a letter mailed aboard the Titanic during its first and only voyage; Amelia Earhart’s brown leather flight suit; a mailbox remnant from the 1906 San Francisco earthquake; and a mailbox from the September 11, 2001, terrorist attacks.